So I know Valentine’s Day was a week ago, but I didn’t have the time to do a post. I have been very busy with packing this last week. Surprisingly though I haven’t done too much packing. Kitchen stuff is packed, all my craft supplies are packed, including all knitting and sewing and cross stitching, and some of my other belongs are also all packed. I still have books, clothes, bathroom stuff, and some more other belongs. Since I’m moving into the new place this Friday I’d say I’m a little behind, but if I get the bathroom stuff and books packed today I think it will make up for it. So the picture above is what my boyfriend got me for Valentine’s Day. We didn’t go out for Valentine’s Day, just stayed in and enjoyed each others company, which I find really nice. Better than going out to some restaurant and spending $100 on one meal. I also ended up getting my boyfriend something too. I found this neat idea on Pinterest for making a card. All you need to do is make any kind of design and then put a hole in the middle of the design and then put holes outlining the whole design. 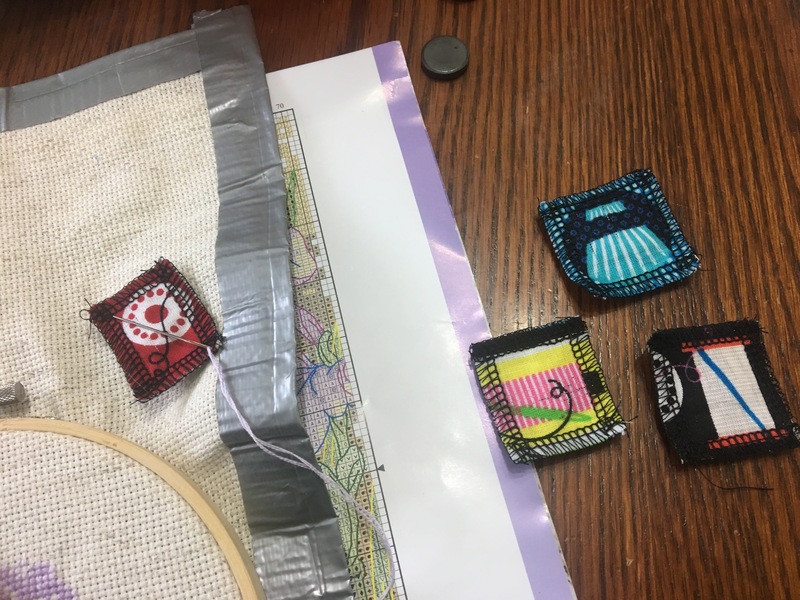 I chose to do a heart for my design: Next, you can use any type of thread and then starting from one hole in the outlined design you bring the thread out and put it into the center hole you made. You keep on repeating thing until you have covered the design. This is what my card ended up looking when I was all finished: I used my variegated thread from DMC that I got for Christmas to make this design. I wish the holes weren’t so visible, but not all of them are and he really liked it so it doesn’t matter. So since I am moving I expect I won’t really be able to get any other posts up here for the next week or so, mainly because of getting stuff packed and then unpacking in the new place and then I am not sure when the internet will be hooked up, still waiting for them to call, but they did say they would call today or tomorrow. So anyway I have decided on doing a major update today of everything I’m working on. 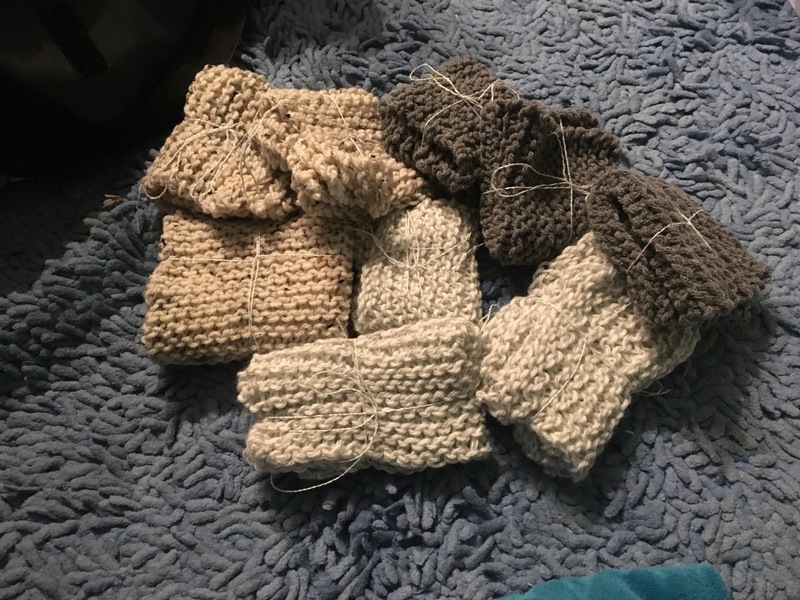 So I was hoping to have the pillow all finished before I moved in or a least try to finish the whole cross stitch part of it, however, I have been caught up in packing, not feeling great early last week and then being really sore all last week. So I haven’t done as much as I would have liked, but regardless here is what I have finished so far: I will have to iron this piece when I’m all done it and also wash it as well. Now for the Mother’s Day card. 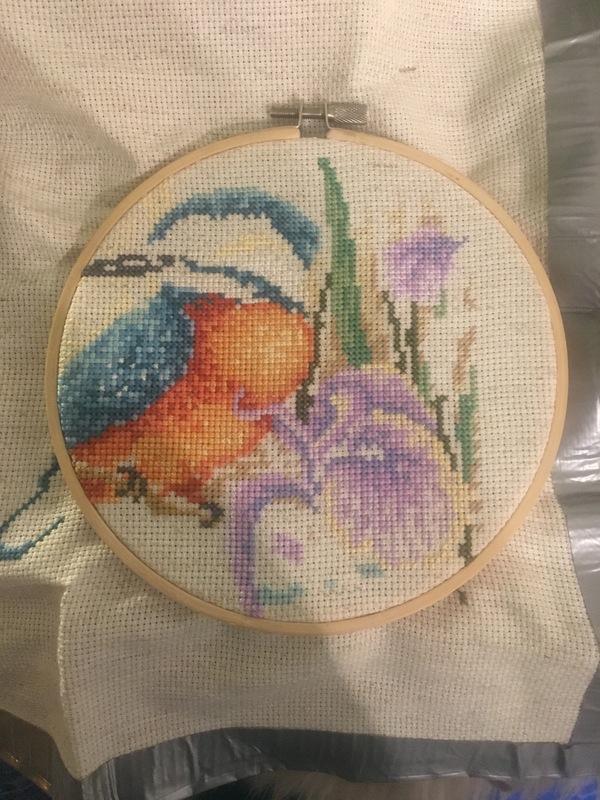 Now, this I think I have done a lot of work on since you last saw it, however I actually kind of wanted it to be done by now, but as I said I’ve been busy with other stuff so no time to sit down and cross stitch. I am hoping though that I can at least finish all the cross stitching before I move and then once I’m settled I can just finish the backstitching and then put it into a card. 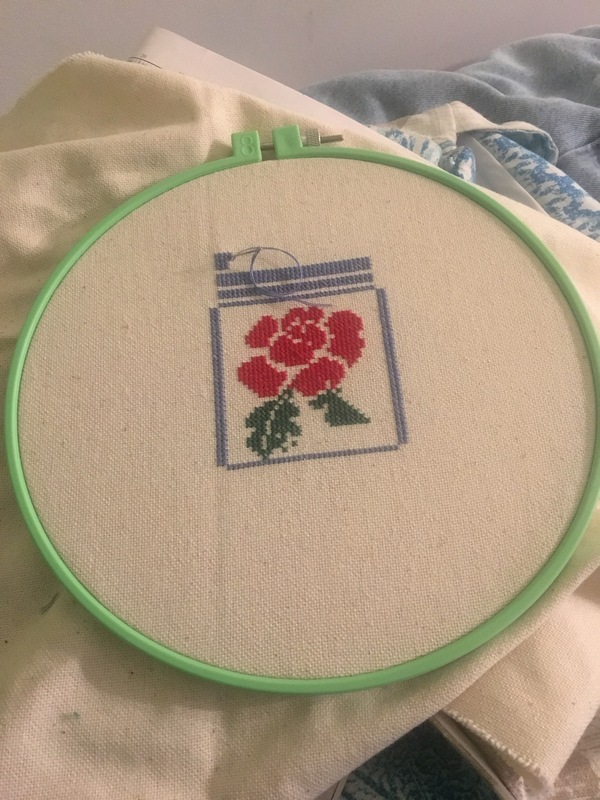 This piece you haven’t seen before, but it’s going to be a birthday card to my mom: I actually started this about two years ago and because of running out of time the first year and then the second year I lost thread I haven’t been able to give it to her yet. So this year I’m going to start it now and try and look for similar colour threads to match the colours that are missing. I think I might work on this today instead of working on the Mother’s Day card. I know Mother’s Day is sooner, however, this one is almost finished and it would be a nice change of doing something. I’ll probably do it little by little in-between the packing that I want to do today. Well, this is probably going to be the last update I do this month, so have a great rest of your February and for those of you living here enjoy the rest of your Family Week-Long Break. So on monday I was feeling very crafty. 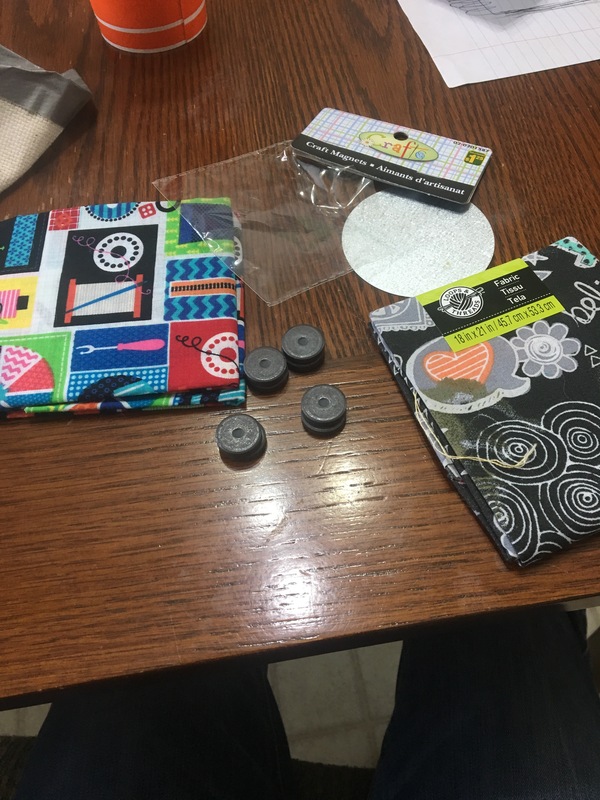 so I went to Dollarama to get some magnets and from the fabric I had gotten when I got fabric to make those coaster I decided I would make something that I saw on late sunday night. All I did was cut out little pieces of fabric and with using a serger I surged around the edges. I had to get my friend to help me with this part, because I am not the most skilled with using and serger. So anyway they work pretty well except for one thing…the magnets aren’t strong enough so they don’t hold through the fabric very well and often fall off. I think I will go get new magnets some time after christmas and just re-glue the same fabric pieces on, since I find them really cute.